Far-flung family: Jan spent two weeks in Europe in late October-early November. Over the first week he spent time with family in Vlissingen and Venlo, Netherlands. During the second week he visited his father in Alicante/Abir, Spain. While there, Jan and his father took a three-day road trip to Grenada (they toured the Alhambra in the pouring rain), Córdoba (the Mezquita Catedral), La Linea on the Costa del Sol, and Gibraltar. Busy Boo-ing: This year Sofia was very busy in the weeks leading up to Halloween. She not only went to South 47 Farm to look at pumpkins, but while Jan was gone to Europe, Amy also took her to Remlinger Farms, where she enjoyed lots of rides and even climbed a 20-foot climbing wall. She saw Rumpelstiltskin at Molbak's and Willie Wonka and the Chocolate Factory at Studio East. She went to The Halloween Store's haunted house (toned down for kiddos) and the Jump Planet haunted house, too. She carved pumpkins with Amy at her school's evening Pumpkin Party, and another one with Scott, Suzy, and Brennan. And she wore her costume all day for the school Halloween party, which included a parade, games in every classroom, and a class party for which Amy dressed up and helped out. 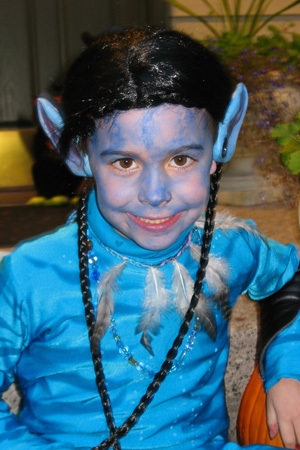 The season culminated in trick-or-treating as the Na'vi heroine Neytiri with friends on a wonderfully dry and relatively warm October 31st. Animal house? : Cameron officially moved into the UW Sigma Phi Epsilon fraternity house on September 11th. He did warn his dad and Amy that the house would be very messy on moving day and that the subsequent week would be devoted to cleaning top to bottom in anticipation of the new school year. However, calling the premises "messy" turned out to be like calling Katrina a "disturbance." Amy's not sure whether she's more sad because Cameron's left home or upset because he's sure to contract salmonella, E coli, Norwalk virus, giardia—or all the above. (Maybe another tour is needed later in the quarter.) Nevertheless, Cameron is very excited to be leaving home and joining this group of young men, whose approach to fraternity living is actually not based on Animal House but on a Balanced Man concept of sound mind and sound body. Outside Sigma Phi Epsilon (currently the cleanest part of the house) on September 11th. 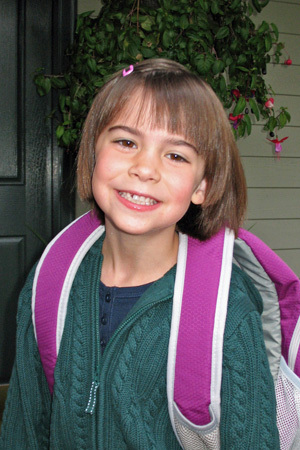 Six-year-old milestone: On Tuesday, September 7th, Sofia entered first grade and began her elementary school career. She's in a 15-student class at Evergreen Academy and is very excited about being a "big kid" and her new school.